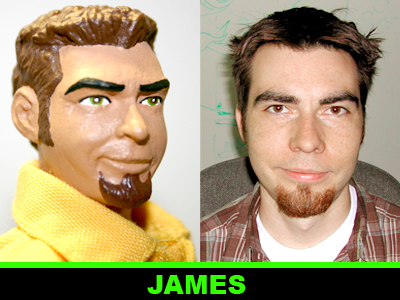 In a sense, I’ve been a Mego customizer since childhood. Depending on the day’s play, Star Trek characters became Marvel villains, Dr. Zaius was an alien ambassador or maybe a few super heroes played guest-starring roles on the bridge of the Enterprise. Little did I know that one day I’d put all that experience with silly putty and Crayola markers to a different use. 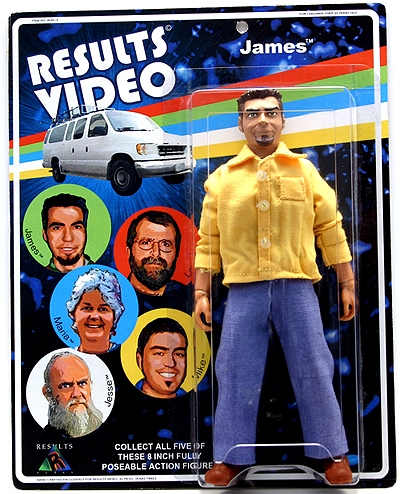 My adult-onset customizing began in 2002 after having discovered the Mego Museum one year earlier. It was through the museum’s forum that I heard about others having “customized” their own Mego figures for display purposes. Sculpting had long been a hobby of mine, so I decided to give it a try at Mego scale and create the characters I had always wanted as a kid. 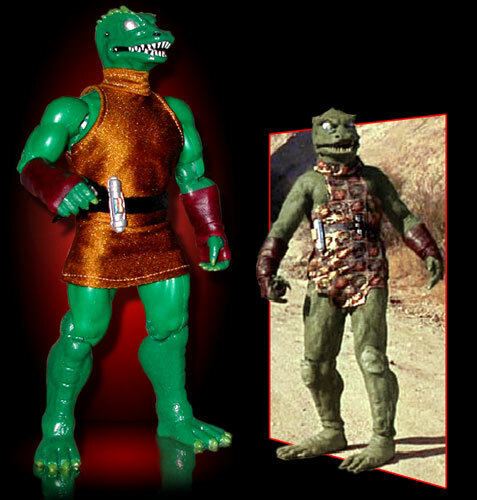 Given my disappointment over Mego’s version, it’s no leap to figure why the Gorn would be my first sculpt. I gathered some images, grabbed a handful of air-dry clay and got to work. Many hours and two complete versions later, I was happy with the new head. For a larger physique, I decided to build him on a Hulk body. With more clay, I altered the Hulk lower limbs to appear as the Gorn’s—taking advantage the alteration to extend the limbs and heighten the body’s stature. After cutting my teeth on the molding/casting process I had all the new parts cast in plastic, painted and assembled. Throw in a custom universal translator, stone knife and hand-sewn costume and the Gorn Captain is ready to battle Mego Kirk! My only add-on sculpt, the Tellarite is air-dry clay sculpted onto a Mego Boss Hogg head. 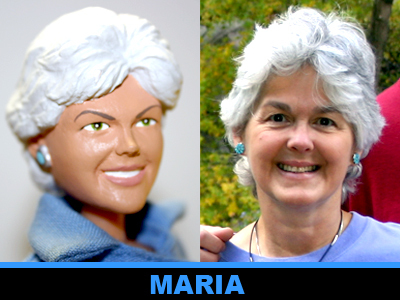 This was my sculpting experiment—to see how easily I could sculpt on Mego’s scale. As such, the sculpting of the Tellarite was actually done before the Gorn, but it remained only as clay on a Mego head for quite some time. It was well after the Gorn project was complete before I decided to mold and cast the hybrid Tellarite sculpt as a finished custom. The Boss Hogg portion of the sculpt can be most easily identified from the back of the head—that’s Hogg’s unaltered hair! 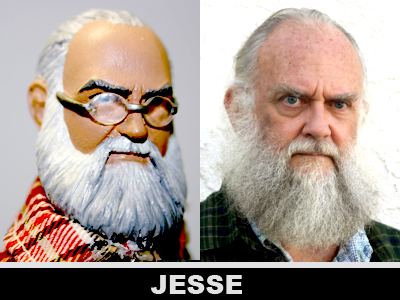 Now that I was sure I could sculpt in Mego scale… I was ready to try a human likeness. 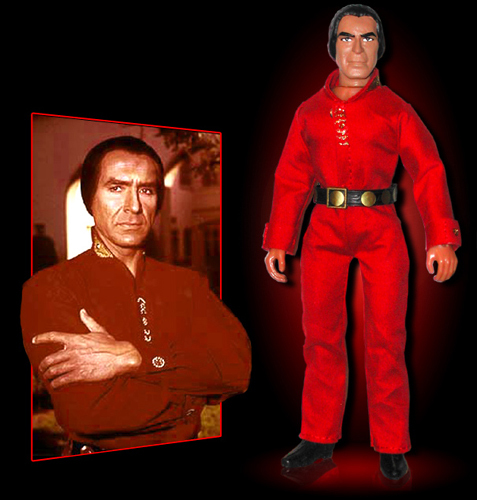 And, as with a lot of Mego lines, I noted that their Star Trek line lacked good villains... thus, the ultimate remedy the villainy-wanton: Khaaaaaan! Khan is the first of my custom figures to sport a handmade costume by Dave McCormick. By this time, my customs had caught Dave’s eye… we discussed my plans to make more Trek customs—and his ability to outfit them. And as such, Khan represents the beginning of a long line of collaboration between Dave and I which would later be called “the McDunsels”. 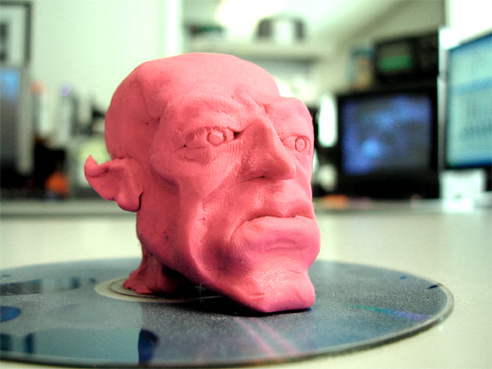 Continuing the line of villainy—the first Klingon of Star Trek became the first Klingon I sculpted. 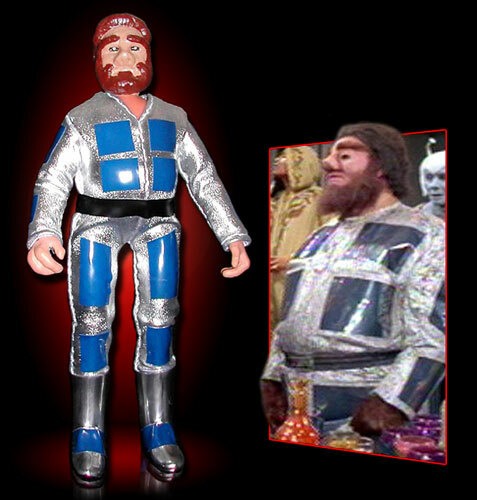 Commander Kor was one I customized as a child… although this version looks a bit different than a Mego Klingon with some sharpie pen marks! I was still using the rough air-dry clay at this point—trying to refine facial details a bit more than the ‘cartoony’ look of Khan. 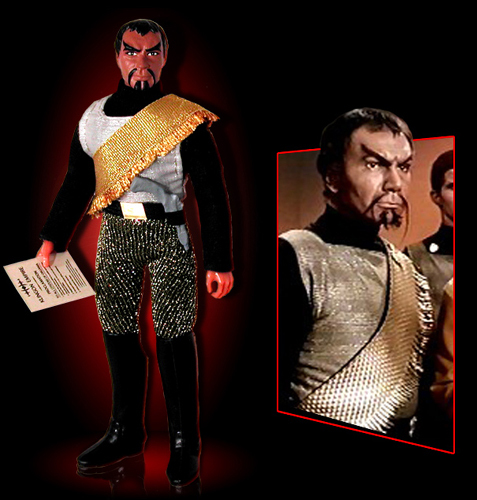 Kor wears a spectacular series-accurate costume created by Dave McCormick, a disruptor modified from a 5-inch Playmates action figure, and a custom printed “Klingon Proclamation” document for all citizens of Organia. Attempting a female likeness was the next step along my sculpting journey. 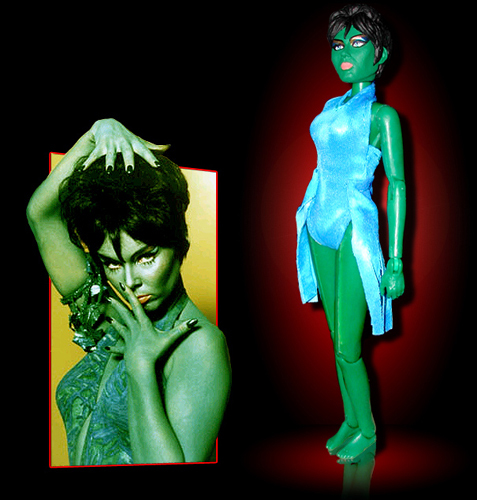 My choice: Yvonne Craig as Marta the Orion. A Wicked Witch body was the obvious choice. With a custom outfit by Dave McCormick, and a dagger from Paul Evans, she’s ready to terrorize Mego Captain Kirk any time! Continuing with female customs, I am particularly pleased with this likeness of Nancy Crater. You can really see what Dr. McCoy fell for. 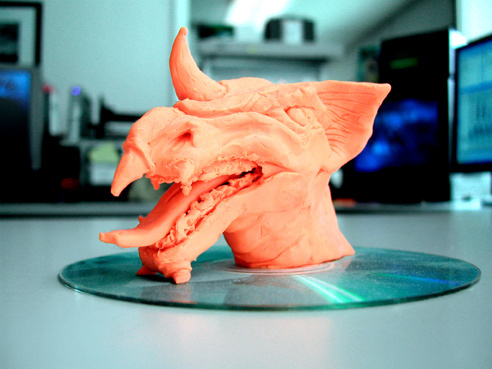 Seriously though, it was fun working on another sculpt as completely alien as the Gorn. 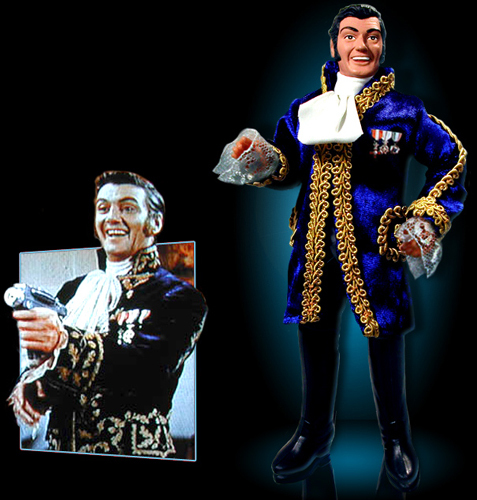 The figure features custom hands designed to attach to any Mego Type 2 wrists and articulate, and is outfitted in a Dave McCormick costume. I had a lot of fun working on this one. By this time I was starting to gain a greater control over refining facial details and this character in particular has a lot of expressive lines. I remember working the sculpt over a few times before being happy with the ‘pained look’ and tortured personality of Commodore Decker. 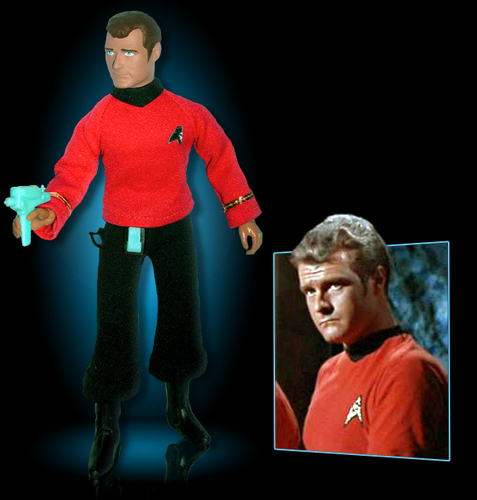 The pants are original Mego. The shirt is original with altered rank sewn in and iron-on printed insignia. 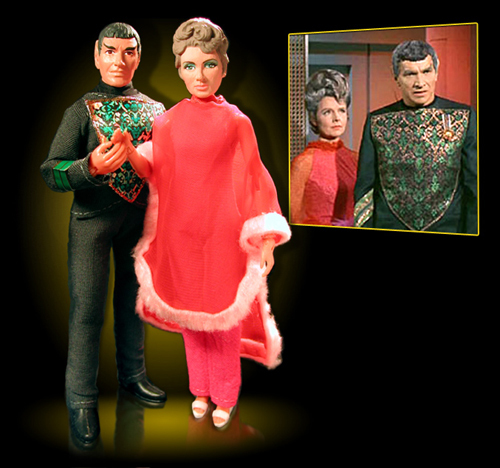 How could any Star Trek collection be complete without Spock’s parents? I simply had to have ‘em. Amanda’s hairstyle was a sculpting lesson in and of itself …and Sarek’s stolid countenance was quite a bit more challenging than I had anticipated. I worked on these two in succession and was anxious to finish the pair. In retrospect I could (and should) have dedicated a lot more time to each of them. Particularly challenging though were the costumes; each being elaborate in its own way. Dave McCormick masterfully tackled them both, combining sheer fabric with feather trim, and incorporating several iron-on prints with cloth and vinyl. Another Klingon! In need of recurring villains, Kang was another character I had customized as a child. Now, I am happy to have an updated version among my collection. 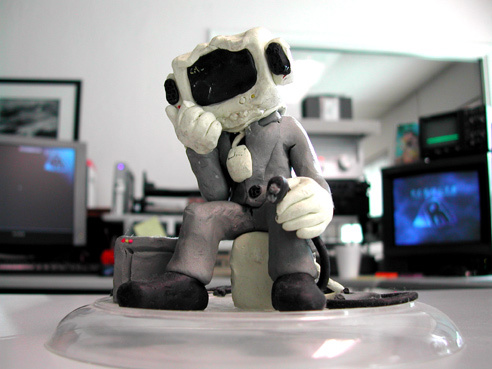 By this time I was in full-swing with the use of polymer clay—allowing more control over detail at small scale. 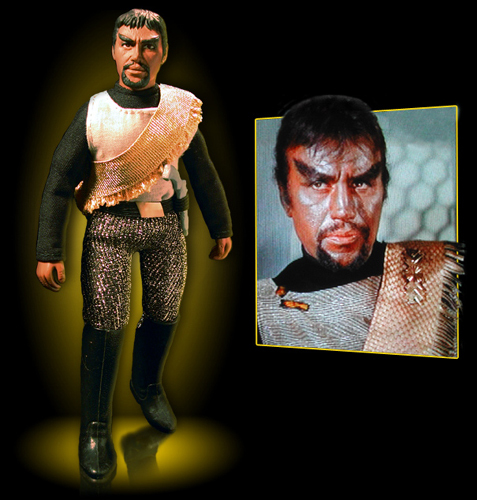 Kang wears a series-accurate Klingon costume designed by Dave McCormick for the earlier Commander Kor sculpt. Appearing in more episodes of Star Trek than some of the regular cast, Lt. Leslie could not escape becoming part of my Mego Trek collection. The costume is all original with rank alteration. 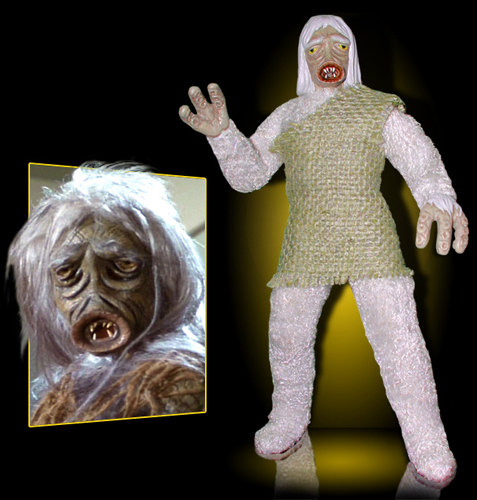 Overall, Leslie was an easy custom to build for such a critical addition to the Enterprise crew. The trivia-inclined can visit www.eddiepaskey.com for more information about Lt. Leslie. There’s nothing like challenging your Mego Kirk to a duel. And no better character with which to do so than General Trelane. 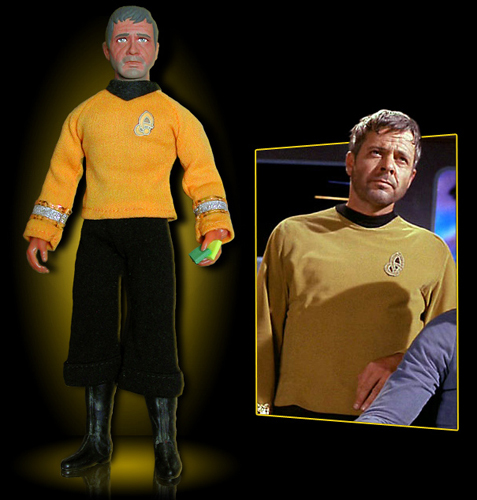 Ah, how we all could have antagonized the entire Enterprise crew had Mego made this classic villain back in the day. The difficult part of sculpting this likeness was choosing a favorite expression—so much so that I painted two versions. But what I imagine was more difficult than that however …was creating the incredibly elaborate five-piece costume. Complete with tunic, vinyl-trimmed vest, pants, pleated ascot, and scrollwork-trimmed crushed velvet jacket …Dave McCormick’s finely detailed costume more than completes this custom Trelane. The unlikely team from Star Trek’s “Assignment: Earth” could have shared many an adventure as Megos—so here they are. 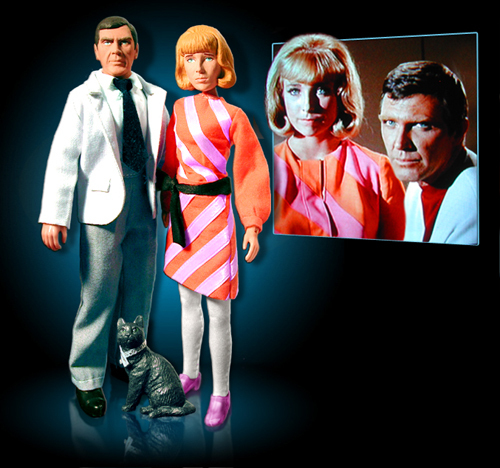 Gary wears a Classic TV Toys white suit dyed two-tone gray with a Dr. Mego business suit shirt and necktie finished off with Wizard of Oz shoes. Roberta wears an all-original Dave McCormick top, skirt, waist tie and leggings. The shoes in this photo of Roberta are digitally painted, but a pair of Glinda shoes finishes her costume nicely. Like most Mego customizers, I too have a day job. And while my career path and sculpting hobby are quite different from one another, in 2005 I had a unique opportunity to merge the two. Over the years my co-workers and many clients have become familiar with Megos and my sculpting through the small collection I have on display at the office. 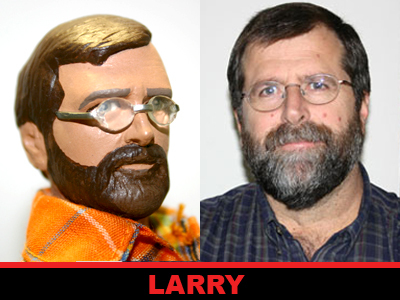 And, when asked to develop a company holiday mailer card based on custom action figures, I jumped at the chance. We developed the theme “Toy to the World”. I sculpted likenesses of employees and owners, worked closely with our graphic artist to create 70’s-style backer card art and with some clothing help from the Museum’s Paul Clare, and plastic bubbles from Chad Gordy, I and my co-workers became Megos! 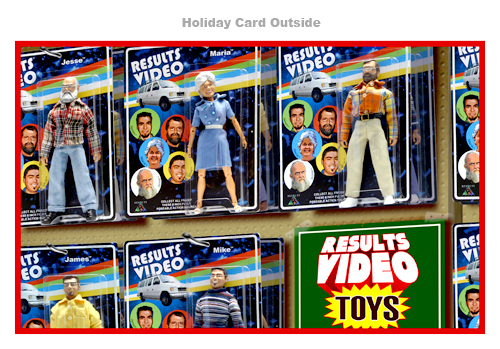 The holiday mailer featured photos of the carded figures hanging in a toy store aisle. 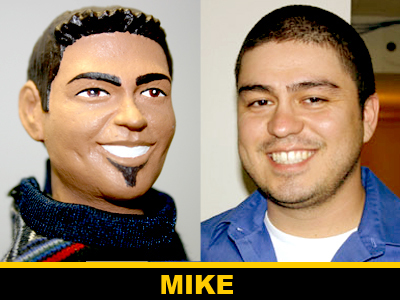 Uncarded versions of each figure now populate the various rooms of our studio—undergoing occasional identity changes. The most popular incarnation is the team dressed as the crew of Star Trek, sitting at consoles made by the Museum’s Mike Farence. Some who have seen the original Megos on display in my office remember playing with them and reminisce. 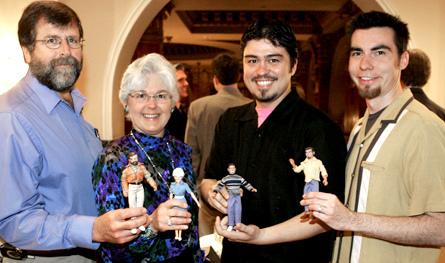 Some recognize them only as the toys from Twisted ToyFare Theatre or Robot Chicken. Others see them for the first time, and simply enjoy their whimsical 1970’s charm. 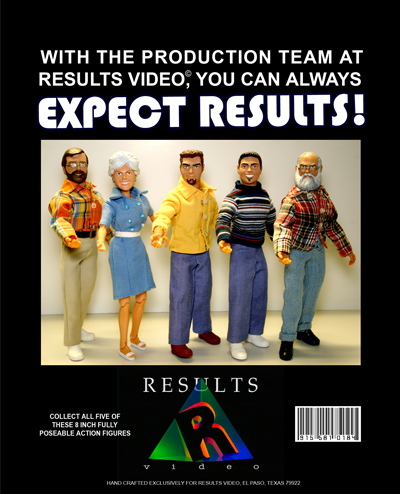 But now everyone who visits Results Video can see the entire crew—real people with whom they interact daily—as Mego action figures! Some early odds and ends.